Six Twenty Seven: How many pours does it take to get to the bottom of a delicious bottle of Moscato? How many pours does it take to get to the bottom of a delicious bottle of Moscato? This weekend I decided to answer a question that had long plagued my brain - - how many glasses can one get from a bottle of wine! I've never polished off an entire bottle of wine in one sitting, so I was clueless about how much bang you really got for your buck. By no means am I a wine expert. For most of my life I actually loathed wine and only drank red during catholic church lol. Last year I discovered Riesling, and earlier this year Moscato made its way into my heart. 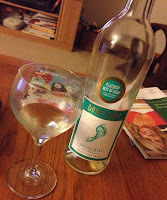 I found this bottle of Barefoot for under $6 at Target on Saturday night, and since my only goal was to stay in all weekend it was the perfect time to do my "research." I decided to watch "American Horror" while I worked my way through the bottle, and I'm not sure that was a good thing. Wow... that is one crazy show. The wine definitely didn't help me understand the dizzying plot, but I digress.... after all was said and done I was able to get 5 very heavy-handed pours out of this bottle. That's about $1/glass average and absolutely amazeballs by my standards. I feel like wine is the way to go. What's your wine of choice? Better yet, has anyone been watching "American Horror Story?" If so, please explain to me the plot... I'm so freaking lost and that bottle of wine did nothing to help me lol.